Adequate nutrition and fertilization are important but are often misunderstood components of the overall management of turf areas. it is extremely difficult to get accurate nutritional recommendations for particular turf areas through visual inspection, so soil and tissue analysis are now relied upon to fully “see” what is going on in the soil and turf plant. There are many factors that influence nutrient uptake and availability, including pH, moisture, organic matter, soil type (sand, silt, loam, clay), and mineral composition. Management practices such as irrigation, pesticide use, and fertilization history also affect the turf’s ability to take up nutrients. Fortunately, today’s professional turf managers have a better understanding and are becoming experts in proper turf management. The soil is more than just a place for roots to grow and anchor the plant. Soil is also critical to providing nutrients and water to plants as well. The four major components of the soil are minerals, organic matter, water and air. The proper balance among these four components is necessary for optimum turf growth and health. For example, excessive water can reduce the oxygen content of the soil and cause roots to die, but insufficient water will cause plants to wilt and inhibit nutrient uptake. The composition and size of soil minerals have an influence on nutrient availability. Some minerals are very insoluble in water, so the associated nutrients may be relatively unavailable even if they are present in large quantities. Nutrient availability is increased if soil particles are small. The composition of minerals affects the release rate of nutrients. A soil high in phosphates or high in pH can reduce certain nutrients, such as iron and zinc. Organic matter is another major component of soil and consists of animal wastes, decomposing plant material, and microorganisms. 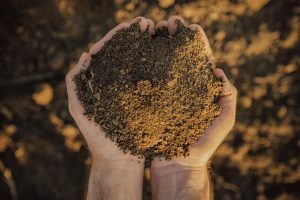 Organic matter is a source of nitrogen, phosphorus, and sulfur and helps to increase the availability of positively charged ions, such as calcium, magnesium, and potassium. Organic matter tends to have a negative charge and holds onto positive ions, affecting their availability to turf grass. Soils that are high in organic matter content are resistant to changes in the pH, and tend to have a high water holding capacity. Often, soil contains sufficient nutrients for plant growth, but these nutrients are in a form that is unavailable to the turf plant. For example, we have seen soil tests show excessive amounts of potassium in the soil; however, only small amounts are actually available to the turf. Soil pH is probably the most important factor affecting the availability and uptake of plant nutrients. Some nutrients become more available at a low pH, others at a high pH, while others are more available between the two extremes. Soil pH levels between 6.0 and 7.0 show the highest nutrient availability for all plant nutrients. An obvious method for determining adequate nutrients available to turf is to look for symptoms such as pale foliage, poor growth, or even discolored turf tissue. Often particular combinations of symptoms are associated with specific nutrients. The disadvantage of relying on visual diagnosis is that by the time the symptoms appear, turf quality and performance have already been compromised. Also, it is rare that only a single nutrient is deficient. For example, high pH soils reduce iron (Fe), manganese (Mn) and zinc (Zn) availability almost simultaneously. Basic fertilizer recommendations on visual symptoms alone is risky and not efficient. Soil test and Tissue tests are the best analysis for determining what nutrients are actually available in the soil profile. Complete soil tests can serve as an important diagnostic tool in determining what is needed for optimum plant health and growth. The relative acidity or alkalinity of a soil. A pH of 7 is neutral, a pH of less than 7 is acidic, and a pH greater than 7 is alkaline. A measure of the ability of a soil to adsorb calcium, potassium, magnesium, and ammonium ions and of its resistance to change pH in response to liming or sulfur additions. Clays and soils high in organic matter tend to have a high CEC, while sands have a low CEC. A positively charged ion. The most common in soils are calcium (Ca), potassium (K), magnesium (Mg), and aluminum (Al). The percentage of exchange sites that contain a calcium, potassium, magnesium, or other cation. The higher the percent base saturation, the higher the pH.